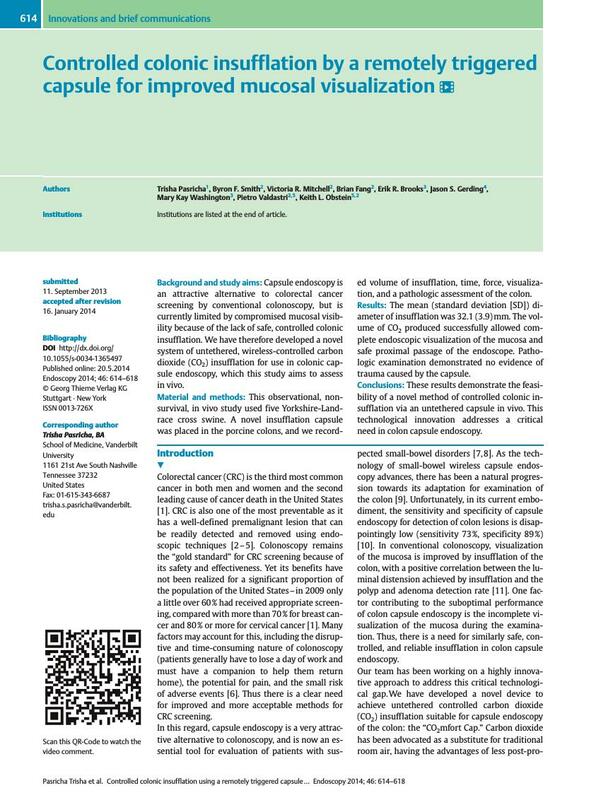 Background and study aims: Capsule endoscopy is an attractive alternative to colorectal cancer screening by conventional colonoscopy, but is currently limited by compromised mucosal visibility because of the lack of safe, controlled colonic insufflation. We have therefore developed a novel system of untethered, wireless-controlled carbon dioxide (CO2) insufflation for use in colonic capsule endoscopy, which this study aims to assess in vivo. Material and methods: This observational, nonsurvival, in vivo study used five Yorkshire-Landrace cross swine. A novel insufflation capsule was placed in the porcine colons, and we recorded volume of insufflation, time, force, visualization, and a pathologic assessment of the colon. Results: The mean (standard deviation [SD]) diameter of insufflation was 32.1 (3.9) mm. The volume of CO2 produced successfully allowed complete endoscopic visualization of the mucosa and safe proximal passage of the endoscope. Pathologic examination demonstrated no evidence of trauma caused by the capsule. Conclusions: These results demonstrate the feasibility of a novel method of controlled colonic insufflation via an untethered capsule in vivo. This technological innovation addresses a critical need in colon capsule endoscopy.